Two weekends ago when our daughter was visiting grandparents in Idaho we decided to take a little hike. A 7-mile round trip hike to be exact. To most adult hikers, 7 miles is nothing. For a 7-year old girl it is a very long hike. Since our 7-year old was gone, we thought we would take a nice “adult hike.” We packed a lunch and camera gear and headed east from Portland. We picked up a Northwest Forest Pass along the way and found the trailhead in the Mt. Hood National Forest a few miles north of Zigzag. Once we started up the trail we noticed that there were a lot of kids and the kids weren’t whining. A good sign! If kids aren’t whining then that means adults will find the hike very enjoyable. We hiked along the eroded banks of the Sandy River, and before we knew it, we were at Ramona Falls. The falls were amazing and we spent an hour eating lunch and taking a lot of photos. If you ever find yourself near Mt Hood, we highly recommend this hike. And, it seems to be kid friendly. We will know for sure when we drag our daughter there for the ultimate test. 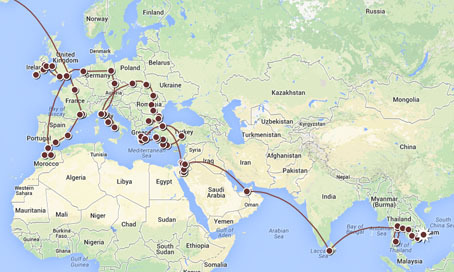 In planning our round-the-world trip we have most of the first year of our travels figured out, but the second year is a little fuzzy. We will begin our second year of round-the-world travel in Egypt, an ancient country with a wealth of history. We have always wanted to travel to Egypt but trying to pinpoint what to see and where to stay is a bit of a challenge. Since we will be on a tight budget we will need to limit our stay to only a couple of areas, but which areas to stay in is the real question. From visiting the pyramids near Cairo, King Tut’s Tomb in the Valley of the Kings near Luxor, cruising along the Nile River, or enjoying the luxurious crystal clear water and sandy beaches of Sharm El Sheikh on the Red Sea, it’s a tough decision. For more information on Sharm El Sheikh, you can visit www.cheapholidays.com/sharm-el-sheikh/. Our current plan is to fly into Cairo from Turkey after staying there for a 2-3 months. Once in Cairo we will see the pyramids and sphinx and our daughter is hoping to do the ultimate tourist activity in Egypt, ride a camel. We have heard that there is a little scam where they have you sit on the camel for a photo, but then won’t have the camel kneel back down until you pay them money. Nice! We will be sure to agree upon a fair price before ever sitting on a camel. After the hustle and bustle of Cairo and the pyramids we would like to head to Luxor to visit the Valley of the Kings. There are two options to get to Luxor from Cairo. The fastest and cheapest way is to take a plane, which would get us there but we would not get a chance to see other parts of Egypt. The other option is take a 14-day Nile cruise from Cairo all the way to Luxor. Cruises between Cairo and Aswan have been banned for the last 15 years due to water levels, but the ban has been lifted just this year. It would probably cost a good chunk of money for the cruise, but having lodging, food, entertainment, and transportation for 14 days it could actually be the better alternative. Plus, cruising along the Nile for 2 weeks would be the trip of a lifetime! So, we still have a bit of time to work out all the details. If anyone has any recommendations about what to see or what not to see in Egypt, we would love to hear it. Are you thinking of going on a walking holiday? Here we take a look at where to find walking holidays as well as some key walking holiday tips such as making sure you are fit enough, always walking with other people, checking the weather forecast and being prepared for emergencies. There are various ways in which you can find a walking holiday. One way is to do it independently and just find destinations with nice scenery and then plan your own walks. Alternatively, you may want a package walking holiday, and you can find walking holidays in Europe from Inghams.co.uk. If you walk on your own you are more vulnerable, so always walk with at least one other person. This is especially true if you are not an experienced walker. If you are travelling alone, it is best to book a group holiday with a walking holiday company. This way you will never be walking on your own. It should be no surprise to you that a walking holiday involves a lot of walking. You may end up walking every day and you need to make sure you are fit enough before you go. In the months and weeks leading up to the holiday, make sure you do plenty of walking at home. If you are not going on guided walks, make sure you familiarise yourself with your walking routes before you set off. The last thing you want to do is to get lost, as you could end up being out for much longer than you anticipated. Again, this mainly applies if you are planning your own walks. Make sure that people can find out where you have gone should anything happen. Leave details of your route with somebody, for example friends, family or the place where you are staying. If you are walking in the mountains it is essential that you check the weather beforehand. Bad weather can make mountaineering very dangerous, especially in remote areas or exposed paths. You never know what might happen while you are out for the day, and you could end up getting stuck somewhere and being out for longer than you expected. Always pack extra food and water, a first aid kit, extra clothes and a mobile phone.